A website is a structured collection of pages. It is important to have a clear strategy when planning this structure so that your website pages will be logically connected with each other and visitors will be able to navigate your website easily. A well-structured site means the visitor will not get lost while looking through it, and will always know where he is: he must be able to find the information he is looking for quickly. A badly-structured site confuses and frustrates the visitor and, in the worst case, leads to him abandoning the site altogether. The Sitemap Creation window is where you plan your website's structure. You can add all your pages and organize them in varying levels. 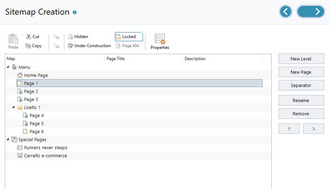 Once you have defined the structure of the Map with page titles, you can proceed to add the contents of the pages. Click repeatedly on the Next button to open the pages in the same order they have been added to the Map. Alternatively, you can use the Map to open the Program's window where you can work directly on a particular page: double-click on the item in the Map or select it and click on the Next button. Most of the space in the Sitemap Creation window is taken up by the website Map tree, which is a schematic representation of the website Map you are creating. A basic map is shown by default. It has a Menu folder that contains the Home page and 3 other pages. You can use the available commands to add levels, pages and separators to create the website Map you want. If you add a built-in search engine (see Search Object), a Entry page, a Blog, a Members' Area (you only need one page set as a Locked page) or a Shopping cart, a folder called Special Pages will be added to your Map and it will include the following items: Search, Entry page, Blog, Login and Shopping Cart. 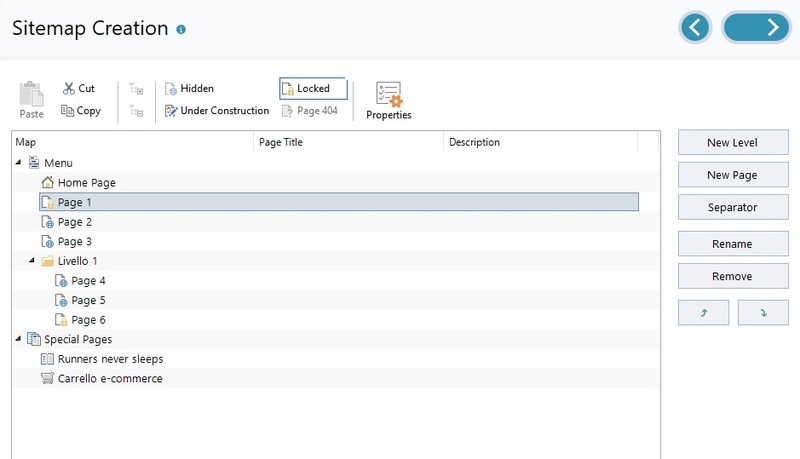 As well as showing the Map's tree structure, other useful information is given for the pages you add, such as the Page Title and the Tag 'Description'. This information is taken from the definitions given in the Page Properties window, which you will have previously filled in. These commands cut, copy and paste the selected pages in the current project or to different projects. These commands are also available in the popup menu that opens if you click on the right-hand button of the mouse on the Map. These commands expand and collapse the selected level to show/hide the pages in them. Select this command if you want the current page or level to be hidden in the Map. If a level is hidden, then all the pages in it will also be hidden. A hidden page can be useful as a means to give further information on a particular topic, and it can be displayed by creating a link to it at the necessary point. Remember to create at least one link to a hidden page, otherwise it will not be accessible. This command opens the Locked Page window, where you can lock a page by clicking on the Set this Page as Locked option. You must then specify which groups and/or individual users may access the Locked page, clicking on their names in the list that is displayed. Giving access to a group is not the same as giving access to all the users in a group: only in the first case, if new users are added to a group, they will have automatic access to locked pages if the group already has access. Go to the Access Management window in Step 1 - Website Settings | Advanced to create new Groups/Users. This command is used to set a page as "under construction". The pages "under construction" are shown in the Map with a different icon. They are, obviously, incomplete pages and will be displayed in previews, but they will not be published online with the rest of the project, and neither will the items in the navigation menu that refer to them. This option defines the selected page as the 404 Page. You can only have one 404 page in your project, and it must not be a page that is Special, Locked or Under Construction. ▪ invites the visitor to continue navigating the website. WebSite X5 creates a .htaccess file which contains the instructions for setting up a custom 404 page. This feature is only available for the Apache Web Server. Set the properties for the selected page (in the Page Properties window) or level (in the Level Properties window) in the window that opens. Access to the blog and/or e-commerce shopping cart can be restricted to registered users who have a login and password. Just select the special blog and/or e-commerce shopping cart pages in the map and set them as "locked" with the command. ▪ You can hide the home page in the map, but you should only do so if you are going to provide a link to it in other places in the website, for example in the header. ▪ If you want to create your own navigation menu, you can hide all the pages and levels in the Map: instead of selecting one page at a time, you can select the menu folder and click on the Hidden button. ▪ New Level [CTRL+L]: to add a new level to the menu. There are no limits to the number of levels you can add. ▪ New Page [CTRL+P]: to create a new page, which will be automatically added to the selected level. ▪ Separator: to include a separator, which will help distinguish the various items in the menu. A separator may be a space or a label, and is particularly useful in multi-column menus. ▪ Remove [DEL]: to delete the selected page, level or separator. ▪ Rename [F2]: to change the name of the selected home page, page, level or separator. Levels, pages and separators should be correctly named when they are added because the items in the menu are automatically included in the navigation menu, as titles for the individual pages and as names of the HTML files that correspond to each page, unless otherwise specified in the Page Properties window. ▪ Move up [CTRL+U] / Move down [CTRL+D]: to change to the order of pages, levels and separators, moving the selected item up or down. You can also change the order to levels, pages and separators directly in the Map: select the item that you want to move, drag it to the required position and drop it into it. You can make multiple selections for levels, pages and separators using the CTRL and SHIFT keys.